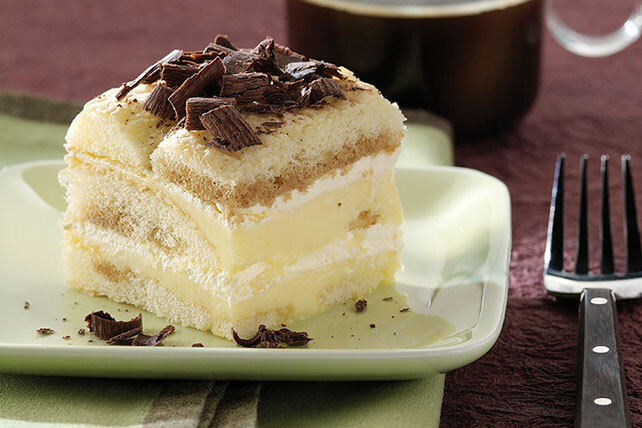 A vanilla pudding filling puts a tasty twist on classic tiramisu. Chocolate lovers, not to worry—there's still grated chocolate on top! Beat cream cheese in large bowl with mixer until creamy. Gradually add milk, beating well after each addition. Add dry pudding mix; beat on low speed 1 min. Sprinkle cut sides of ladyfingers with coffee. Place 1/3 of the ladyfingers in 9-inch square dish; top with layers of half each of the pudding mixture and COOL WHIP. Sprinkle with 1/3 of the grated chocolate. Repeat all layers. Top with remaining ladyfingers and grated chocolate. Prepare using PHILADELPHIA Neufchatel Cheese, fat-free milk, 1 pkg. (1 oz.) JELL-O Sugar Free Fat Free Vanilla Instant Pudding and COOL WHIP LITE Whipped Topping. Place measured amount of cream cheese in microwaveable bowl. Microwave on HIGH 10 sec. or just until slightly softened.